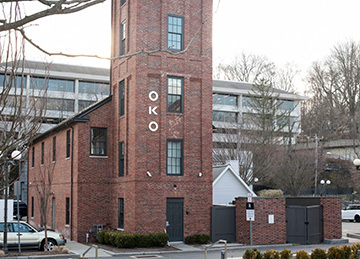 Fashionable Westport, Connecticut just got even more fashionable with Chef Brian Lewis' new restaurant, OKO, housed in the former Vigilant Firehouse. 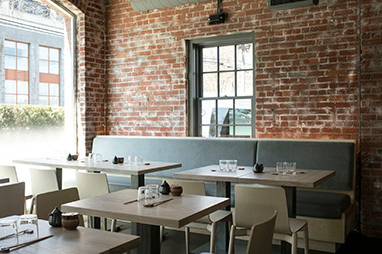 Cool industrial chic, clean lines, exposed brick and two large arched windows overlooking Wilton Road give the restaurant an airy yet intimate ambience to complement Chef Brian Lewis' Japanese-inspired menu. Attractive presentations followed by inspired palate-pleasing combinations make the dining experience most memorable. Attention to detail from the front-of-the-house staff complement the seamless efforts from the open kitchen. Bon Appetit! Oko opened in late April 2018 and we were at the opening party. We returned to dine at the restaurant on June 6, 2018, which was a Wednesday night in downtown Westport, Connecticut. We had a reservation for 5:30 pm and when we arrived the restaurant was already busy with people enjoying cocktails, conversation, and early dinner. Cool music set the pace and rhythm for the bartenders busy shaking cocktails, and for the kitchen and service team flowing smoothly through the restaurant like a well-choreographed dance ensemble. Votive candles and ceramic covered pitchers of soy accessorized light wood tables, four stools overlooked the open kitchen for guests to dine and watch the action, and more stools fronted the long wood bar for patrons to dine as well as watch the bartenders at their craft. The culinary focus of the restaurant is Japanese-inspired cuisine, and the "menu celebrates Japanese techniques and traditions with Chef Lewis' signature culinary style; using ingredients from local farms and waters here in Connecticut, throughout the US, as well as the Tsukiji fish market in Japan." 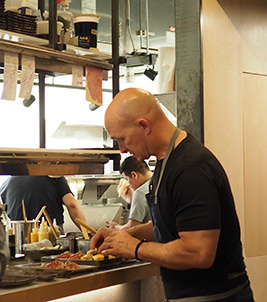 Before opening OKO, Chef Brian Lewis traveled to Japan where he learned the art and technique of Japanese cuisine doing stages at restaurants. Since the very beginning, Chef Brian Lewis is someone who continues to set the culinary pace graduating with honors from the prestigious The Culinary Institute of America in Hyde Park, New York, receiving a Bachelor's degree in Business Management from Johnson & Wales in Providence, Rhode Island, and honing his craft working with such notable chefs as Chef Jean Louis Palladin and Chef Marco Pierre White at such acclaimed restaurants as Lutèce,Oceana, The Sign of The Dove, Rockenwagner, The Village Pub, Bix, The Barn and The Farmhouse at the Bedford Post where he worked with owner, Richard Gere. He went on to open his first restaurant, elm in New Canaan, and opened The Cottagein Westport in December 2015. The well-stocked bar features an impressive lineup of Japanese whiskeys in addition to other spirits, along with a nice selection of sake, wine by the bottle as well as by the glass, beer, and tempting signature cocktails. We began our experience at OKO with two of their signature cocktails, Vigilant & Co. (named for the former Vigilant Firehouse) made with Rittenhouse Rye, Applejack, Plum Brandy,and Vermouth, served in an attractive sherry glass and garnished with a perfect crescent of lemon peel, and One Knight Only made with Kyoto Gin, lychee, yuzu sake, lemongrass and garnished witha wisp of lemongrass. Both cocktails were beautifully presented, well-crafted, and deliciously balanced. Sitting at the Chef's Table we had the opportunity to watch Chef Brian Lewis and his talented team execute flawless presentations. 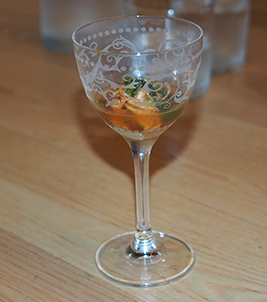 We had the Chef's Tasting Menu, with our first "taste" from the "Cold & Sashimi" section ofthe menu with Uni & Caviar Shots,which consisted of Santa Barbara uni, Shiro dashi, osetra caviar, and yuzu fennel, which was perfection presented in a sherry glass. The flavors and textures intrigued and enticed our palates, a complete seduction of our senses to begin our dining experience. 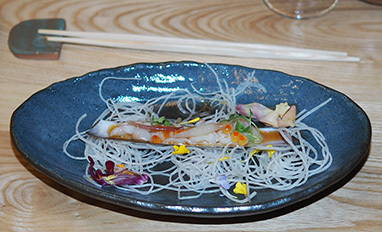 Next came Razor Clams with cauliflower, smoked trout roe, dashi-ponzu, garnished with edible flower petals. As divers, we had seen razor clams in the ocean, however this was our first time eating them. Attractively presented, we were absolutely delighted to make their acquaintance. The taste was light, luscious, and lovely enhanced with the edible flower petals, some of which were slightly bitter, tangy, and even sweet. Complemented by the smoked trout roe, it was a definite palate pleaser. 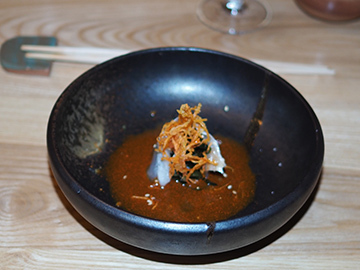 We continued with the Kombu Cured Atlantic Fluke with carrot-ginger ponzu and hijiki seaweed. This was a wow of a presentation when the first bite of the crunchy, sweet carrot hit the palate followed by the very tasty fluke in a broth that begged for a spoon to appreciate every mouthful. Moving on the "Nigiri Sushi" section of the menu, we had Hamachi, snapper found at 800-1,000 feet below the sea. Sweet, buttery and paired with slowly cooked scallion aioli and sesame gomashio, it was a stunning taste of the sea. King Salmon with yuzu kosho, finger lime, and shiso followed. This was a delightfully delectable combination of flavors and textures with the fried shiso in complete harmony with the sweetfish. 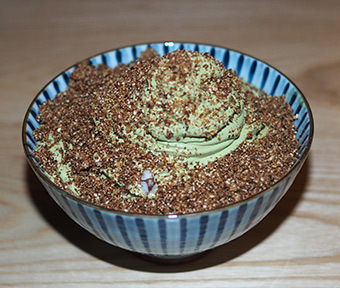 Marinated Tuna with avocado, soy caramel, and quinoa was another show-stopper, and was like eating a savory candy with its deliciously crunchy quinoa and tiny avocado crown. O-Toro Tuna made from the belly of the tuna from Japan with barrel-aged yuzu shoyu was another delectable taste. Next there was Porcini Mushroom with wild ramp butter and truffle soy, which was exquisite. 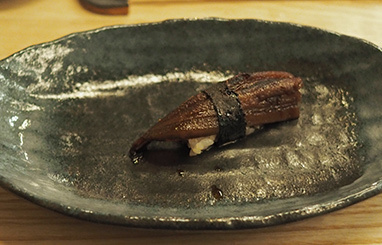 The deliciously "meaty" earthy mushroom wrapped in a thin ribbon of nori and presented on rice was a perfect pairing. 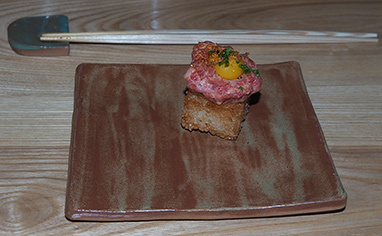 A5 Japanese Miyazaki Beef with garlic soy butter and quail egg presented on a square of crispy rice was gorgeous to look at, and even better on the palate. Japanese Sea Eel with kabayaki glaze and sansho, a type of Japanese pepper from Kyoto, was fabulous. Although (Edward) had eaten eel before, for (Debra), this was another first. Sweet, delicate, and a mélange of flavors made it a standout. 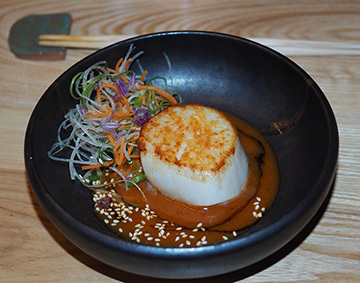 From the "Hot" section of the menu, we had the Seared Sea Scallop which was presented with a perfect golden crust with kimchi butter and squid caramel lightly dusted with sesame seeds. A pretty presentation in a spicy sauce was a nice pairing with the slightly briny sweetness of the sea scallop, with lingering flavors on the palate as a memorable reminder of this delicious taste. 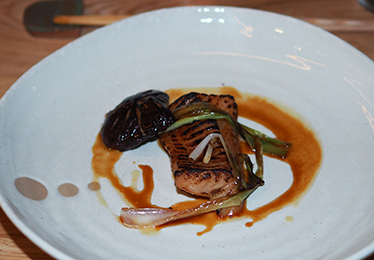 Our last savory taste was the Torched Black Cod with madeira shoyu glaze, cedar grilled shitake, scallion, and Kyoto miso. We watched with awe as we saw Chef Brian Lewis use a blowtorch tolight a corner of a thin piece of cedar, then gently blow it out, and place it on top of the cod. When he delivered it to our table, he removed the cedar, which lent a smoky aroma to this impressive dish. A fabulous presentation that followed through on the palate for the perfect finale to the savory portion of our dinner with tender, flaky cod with its torched crust, meaty mushroom, and tasty scallion. We ended our evening on a sweet note indulging in house-made softserve ice-cream, Matcha ice cream topped with sesame popcorn, and Vanilla MatchaIce Cream Twist with bittersweet chocolate sauce, and a Matcha Kit Kat. Arigato gozaimasu (Japanese for thank you) to Chef Brian Lewis for bringing a delicious and inspired taste of Japan to Westport, Connecticut. OKO is open for dinner Tuesday through Saturday from 5:00 pm until close, and Sundays starting summer of 2018. 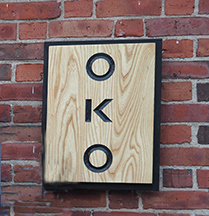 OKO has a sister restaurant, The Cottage, located at 256 Post Road, Westport, Connecticut where the culinary focus is on creative American food to provide two different, but delectable culinary visions. © June 2018.Luxury Experience. www.LuxuryExperience.com. All rights reserved.